Dr Saima Ghazal is specializing in behavioral decision research and technology (e.g., psychometrics, risk literacy, predictive modeling). She completed her PhD in Applied Cognitive Science and Human Factors (ACSHF) with emphasis in decision making at Michigan Technological University (USA), December 2014. Her research focuses on Individual differences and decision making with applications for business, human resources, and consumer protection. Further, she has been working on developing theoretically grounded adaptive, online assessment technologies for research and training. 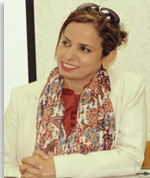 Dr. Saima has around 15 years of university teaching experience at graduate and post graduate levels, with a primary focus on Organizational Psychology, Statistics and quantitative research. She has 10 publications on her credit, including impact factors and local journals. She has received several competitive awards for her research and teaching, including Dean’s Award for Outstanding Scholarship-2014 (outstanding graduate student award—Top 1%), awarded by Graduate School of Michigan Technological University, MI. She also has won Vice chancellor’s Performance evaluation award (teaching based) and incentive award (research based) for the year 2015. She is a lead programmer for the RiskLiteracy.org – an International collaborative project (2012-current), and associate editor of the Institutional Journal of Behavioral Research (2014-current). Dr Saima is also skilled in many computerized and online quantitative content platforms (e.g., R, SPSS, and other statistical software; Canvas and Blackboard; HTML, SurveyWiz, Unipark, Internet and online experimentation).